The best Hostel I've had in Spain, probably the best ever. Staff is happy and friendly, amazing view from the rooftop with a bunch of people enjoying their free Sangria every night, perfect atmosphere. Absolutely clean and amazing rooms, modern bathrooms and kitchen. Thanks for the good time! Clean facilities and very central location. Friendly staff and free sangria nights allow a chance to meet lots of people. The map they gave me was incredibly helpful with getting around and finding lots of local recommendations. I pretty much used it exclusively during my stay. Bunk beds are kind of close together though, and it does get rather loud outside at night due to its location. Awesome place to stay, location is great for getting around and so close to the old quarter. Rooms are spacious and clean with big lockers for bags. Great space upstairs on the rooftop and the breakfast in the morning is good, fresh orange juice was SO GOOD! A very comfortable stay at BedAndBe. The rooms are spacious and tastefully decorated, with tiled floors, big windows, and tall ceilings. They are a pleasure to return to (unusual for a hostel!). The bunk beds are tall and study and each bed has a socket, ledge, and reading light. The bathrooms are well equipped and are in individual rooms along a corridor to offer privacy. You could hear a lot of noise from the street in the dorms, but in fairness it was Saturday night and I could still sleep. Fantastic Location, great building with a lot of character and the roop top is authentic and useful on sunny warm days to chill! Great place to stay as a solo backpacker! It was my first trip as a solo backpacker and the hostel made me feel very safe and welcome. 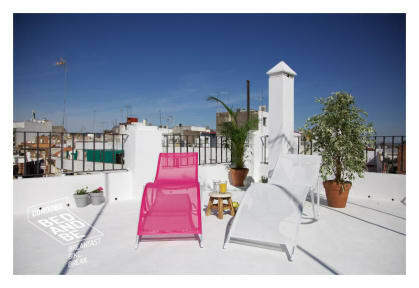 The location is amazing, and there is a very ‘homely’ atmosphere on the rooftop, where the hostel provides free sangria every night so everyone gets to know each other. My only downside would be the noise. The windows were quite old meaning there was basically no filter with the sound outside. Cute hostel with friendly staff. Free breakfast and sangria. However the bathrooms were not very clean and the showers were super tiny. The doors to the room are also super loud. Staff, cleanliness, location really good. But the noise from the street was too much. So was hard to sleep.